Recently, several friends forwarded me some of the exchanges that have been taking place about me on the Corbett list. I wanted to take a moment to respond to a few points. For my part, I first heard about the 29 February 2000 disappearance of Nanoune Myrthil's baby from the General Hospital when Radio Haiti Inter reported on it on 21 June 2001. In a report by Jean-Delec Mezy, the station recounted how a nurse, Yanick Augustin, had been accused of being involved in the disappearance and was slated to appear before a judge that month. I recall that this appearance was postponed several times, and that there were several emotional public appeals by Nanoune Myrthil herself that she and her missing child be given justice. At the time, there much controversy of what exactly had happened to the child and whether or not official pressure was being brought to bear - as it was in the investigation of the slaying of prominent journalist Jean Dominique - to keep the inquiry from reaching some sort of resolution. Some of the transcript of that broadcast can be read here. The regime is affected with a dangerous gangrene. Principles and moral guidelines are compromised every day by political opportunism. Those ideals shared by Jean (Dominique), including a generous but rigorous socialism, respect for liberties within the framework of democracy, nationalist independence, based on a long history of resistance, those ideals that Jean used to call ‘Lavalas’ are trampled every day in this balkanized State where weapons make right, and where hunger for power and money takes precedence over the general welfare, causing havoc on a party which, paradoxically, controls all the institutional levers of the country. Our concerns run deep, since the cracks are widening and the building will eventually collapse over all of us. How right she was, it turned out. In July 2003, Johnny Occilius made his now-famous declaration on Radio Kiskeya of So Anne’s alleged-involvement with the baby’s disappearance and death, followed one month later by former Lavalas deputy mayor of Port-au-Prince Jean-Michard Mercier, who supported in every detail Occilius’ account and expanded upon it. Sonia Desrosiers, the widow of Roland Francois - the Port-au-Prince gang leader who was kidnapped and killed in July 2003 - then gave her own account to Radio Vision 2000. Readers and listeners are free to make up their own minds about the veracity or not of the various explanations of the child's disappearance. In my view, at least, the episode in no way reflects upon vodou, Haiti’s poignant spiritual blend of its African and European heritage, as a whole. I have enjoyed attendance at many vodou ceremonies around the country since 1997, and urge other journalists to treat the belief system with interest and respect given its political significance to the country. Jeb Sprague, whom I have never met or spoken to, first made himself known to me in November 2005, when he emailed to me, unsolicited, a graphic picture of the bullet-riddled, blood-soaked bodies of a Haitian mother and her children along with a smiley-face emoticon and a semi-coherent tirade against myself, the World Bank and the Inter-American Dialogue. When Sprague writes of the 2006 violence in the Port-au-Prince neighborhood of Martissant that I "essentially ignored the role of the largest and most violent armed group in the area at that time: Lame Ti Manchet,” this is false in several aspects. As I wrote in an extensively sourced February 2007 article for AlterPresse "The terrible truth about Martissant," the chain of events that Sprague describes bears no resemblance at all to the reality of what journalists such as myself and the reporters of Haiti’s radio stations witnessed on the ground there in the neighborhoods of Grand Ravine, Ti Bois and Descartes during the summer of 2006. Nevertheless, in both that article and my August 2006 report "Storm of Killing in Neighbourhood Has Wide Implications for Nation," there is in-depth description and analysis of the significant role of the Lame Ti Manchet in the violence. I understand that on-the-ground reportage may be more time-consuming and at times put one at greater personal risk than simply commenting upon issues from the safety of academia in the United States and Europe, but I really urge Sprague to arise from his desk and spend a bit of time on the ground in Haiti, learning the language, speaking with and traveling among its people. I think it would do wonders towards educating him from having a less internet-based knowledge of the daily lives of the country’s people. When Sprague writes, in regards to the killing of Jean-Remy Badio that I "(and Reporters Without Borders likewise) failed to properly attribute the major suspects of this assassination,” this is also false. The Association of Caribbean Media Workers (ACM) is calling on Haitian authorities to move swiftly to bring the killers of Jean-Remy Badio to justice and wants the Caribbean Community (CARICOM) to do more to end the isolation of this Member State... It is especially distressing to note that that Mr. Badio’s murder results from his work in reporting on the operations of organized gangs in the Port-au-Prince suburb of Martissant. When Sprague writes that I have critizied the work of Evel Fanfan and his organization, the Association des Universitaires Motivés pour une Haiti de Droits (AUMOHD), this is also false. I have never written a line, positive or negative, in reference Fanfan or AUMOHD. 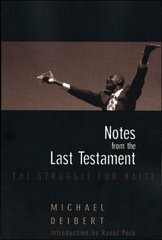 Regarding Jean-Bertrand Aristide: Though I believe his government exacerbated many of the problems confronting Haiti and lost a golden chance to help move the country forward, he was a symptom, rather than the sole cause, of Haiti’s greater malaise. Impunity, corruption, environmental degradation and an upside-down economic system are the true plagues that are killing Haiti as a state, plagues that many in my own country have unfortunately been all-too-happy to cast their lot in with for a few pieces of gold. Until these corrosive elements in Haiti are definitively addressed and the malefactors both Haitian and foreign prosecuted and made to answer for their crimes, there will be more Duvaliers, Aristides and others like them, and whether called macoute or attache or chimere, their economically desperate and easily-disposable (in their eyes) enforces will continue to operate with the same modus operandi. Every time I visit Haiti, I see thousands of decent, dedicated people - part of grassroots organizations such as Fonkoze, the Mouvman Peyizan Nasyonal Kongre Papay and others - working towards their country’s reconstruction. A handful of of self-appointed American and European activists can continue to rage all they want on the interent in support of the work of Mr. Aristide’s fabulously compensated American lobbyists, but the violence and vehemence of their rhetoric doesn’t make what they have to say say any more true.